Verizon is promoting the release of the new ThunderBolt 4G with an advertising campaign featuring bolt lightning. “Harvest” follows the journey of an intrepid young man carrying a cord across a series of urban rooftops as lightning rips across the distant sky. When he inserts his cargo into a bank of wires connected to a lightning rod, lightning strikes, sending a ripple of electricity that sparks a ThunderBolt phone to emerge. “Countdown” (15 seconds) features an epic series of lightning bolts sizzling across an expansive city skyline. The ads follow on from “Delivery”, in which a young man opens up his new Thunderbolt 4G to unleash the lightning. 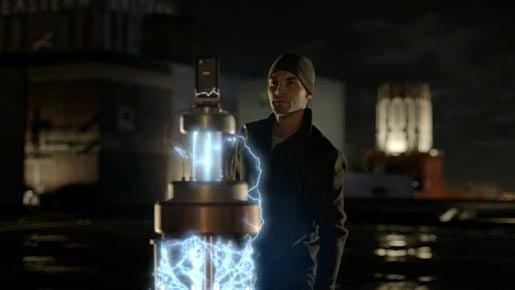 The Lightning campaign was developed at McgarryBowen by executive creative directors Mark Koelfgen and Warren Eakins, art director Jessica Terlizzi, copywriter Lindsey Lampher, designer Erik Jansen, producer Cherie Appleby, director of music production Jerry Krenach, account supervisor Samantha Reeb Wilson, account managing director Lee Roth. Filming was shot by director Tom Carty via Gorgeous and Anonymous Content with director of photography Jeff Cutter, executive producers Jeff Baron and Paul Rothwell, executive producer/head of commercials Dave Morrison, head of producion Sue Ellen Clair and producer Suzie Greene Tedesco. Editor was Avi Oron at Bikini Edit with executive producer Gina Pagano and assistant Laura Bermudez. Post/Effects were produced at Method Studios, led by lead VFX/Inferno artist Gil Baron. Colorist was Stefan Sonnenfeld at Company 3, Los Angles. Music was produced at Q Department. Sound was designed by Brian Emrich at Trinitite Studios and mixed by Steve Rosen at Sonic Union.